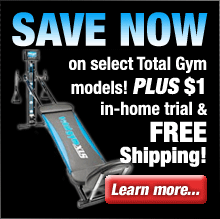 Plus FREE Shipping on Total Gym XLS! Total Gym changed my life. That’s what you’ll hear from countless satisfied customers. This home exercise system will work for any shape, size, or body type. It will work for YOU. Total Gym is an all-in-one fitness solution designed to help you reach your fitness goals quickly. Whether your goals are to lose weight, get long and lean, build strength and muscle, or just feel better about your body, this is the system for you. This home gym equipment gives you versatility, variety, and convenience, for a fraction of the cost of purchasing multiple bulky systems. Saving money while completely changing your body has never been easier. The Total Gym FIT is the newest addition to the Total Gym family. Featuring an all new sleek design and an arsenal of new features and upgrades it represents the epitome of Total Gym fitness technology. 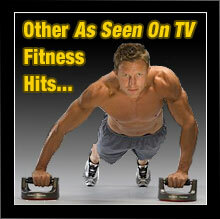 With this revolutionary fitness system you’re able to target all of your major muscle groups with just one workout. The FIT offers twice the levels of resistance of other Total Gym models for a much more powerful workout. The FIT is a versatile and full-featured system that allows you to perform over 85 exercises ensuring a well-balanced workout. It includes numerous accessories including a new ergonomic glideboard, redesigned 2-piece wing attachment, and an upgraded pulley and cable system that enhance the effectiveness of your workout while offering exceptional comfort. The Total Gym XLS can transform your body in only 10-20 minutes per day! The XLS is ideal for those looking to challenge their current workout plan and boost energy to a new level. The XLS exercise package includes over 80 exercises to help you get fit, from head to toe. 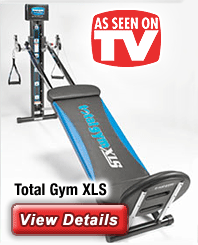 The Total Gym XLS is Total Gym’s most popular model due to its best bang for the buck value. The XLS comes standard with several accessories not found with the lower priced models including the Deluxe Squat Station, Lower Body Circuit System, and the Pilates Package. View the full product details for more reasons why the XLS is the best value in the Total Gym product line. The Total Gym 2000 is the perfect machine for those just getting started, who are looking for a great all-around workout. This exercise system includes essential accessories to get you into a great routine. Compare all three models and choose which one works best for your lifestyle. There has never been a better time to try the Total Gym. With Total Gym exercises targeted to work every part of your body, and with a unique design focused on seamlessly transitioning from one exercise to the next, now is the time to take your workout to the next level. You can use the machine immediately – there is no assembly required, so you can start your new fitness plan as fast as you can open the box. Plus, there is so much confidence in your satisfaction that if you are not 100% on board and happy with your decision to make this home gym a part of your fitness routine, you can return it – no questions asked. Let’s face it, finding time to work out and stay healthy is challenging. Having this exercise equipment in your home, only a few steps away, works for your busy lifestyle and motivates you to take action. With Total Gym, you will never have to wait in line at the health club, or waste gas getting there in the first place. So what are you waiting for? 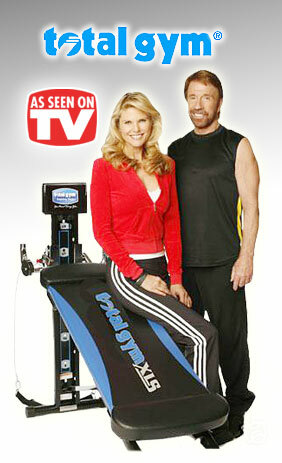 Like Chuck Norris and Christie Brinkley, you too can have the body you’ve always wanted. Make the decision today to begin sculpting muscles you never knew existed. Order today! Total Gym FIT offers an all new design and a number of innovative extras and upgrades that add up to an exceptionally powerful and comfortable workout. The newest addition to the Total Gym family is a revolutionary fitness system targets all of the major muscle groups with just one workout. The FIT provides everything you need for an exceptional total-body workout that takes just a few minutes a day. It’s designed to delivers maximum effectiveness in a minimum of time, making it a great choice for people that have a tight schedule but still want to make time for a great workout. The ultra-efficient design of the FIT allows you to get a great workout in a short amount of time. Additionally the Total Gym FIT offers numerous upgrades compared to previous models to ensure your comfort while working out. 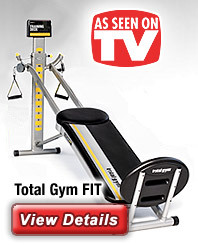 Total Gym XLS home fitness system is all you need to change your body, and in as little as 10 to 20 minutes a day! This powerful machine will help you get into the best shape of your life – and maintain it. The Total Gym XLS is the result of extensive research to provide superior exercise capability, and with over 80 exercises, as well as plenty of accessories to optimize your time spent working out, it delivers a powerful yet comfortable workout. The XLS is the perfect choice for exercise enthusiasts looking to challenge themselves and increase the dimension of their current workout. With the XLS you will build strength and increase muscle mass, as well as tone and tighten your body for a completely rewarding experience that only takes a few minutes a day. Total Gym 2000 home gym is ideal for fitness beginners, who desire to start an exercise program that will effectively lead to attaining a healthy lifestyle. Anyone can use it, as it is well suited for all types of bodies. 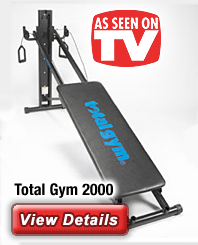 The Total Gym 2000 features a completely user-friendly ergonomic design – no more sore joints or strained muscles. The unique design of this well-built fitness machine allows you to build strength, as well as tone and firm your problem areas, while enhancing your best features. In as little as a few minutes a day, you will see improvement in your overall shape, strength, and level of energy. The Total Gym 2000 is also priced to fit nearly every budget making it an excellent choice for price-conscious fitness shoppers.